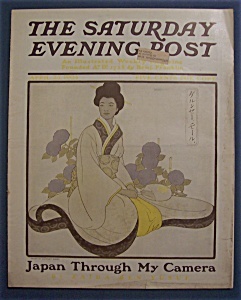 This April 23, 1904 Vintage Saturday Evening Post Magazine shows a picture of a geisha woman and was drawn by Guernsey Moore. This Post Magazine is in good condition with some slight stains and does have a mailing label. This magazine measures approx. 11 1/4" x 14". This Post Magazine contains the following articles: Unruly Sants Domingo, Brave Heart, Japan Through My Camera, Senate Salaries, Anderson Crow,Detective & The Troublesome Truth. This Post Magazine is also filled with many vintage Black & White ads.